Following some polite demands and, quite frankly, some extraordinary begging, we have decided to extend the deadline for this year's awards to Friday, March 29 -- at the end of the day Pacific Standard Time (PST) to be precise. Now in their 15th year, the Leading Lights Awards are handed out each year to the companies and individuals that stood out from the crowd, innovated and took the industry to new heights during the past year. If you've already entered, then you can relax… and you're in good company -- we've had entries from many of the biggest names in the industry, from A to Z. If you've already begun the process of submitting an entry, then you can breathe a bit easier… but don't put it aside -- once we close the entry door on March 29, that's it: No submissions after that time will be accepted. If you haven't started, then you've still got time to hone that submission and pick out the very best of what you've achieved in the past year, but don't delay any longer. To get the ball rolling, check out the categories, because, like the telecoms industry, there are significant changes to take into account. The awards are judged by the Light Reading editorial team with help from the Heavy Reading analyst team. The shortlists will be announced in early April and the winners announced at an awards dinner in Denver (further details to follow) on Monday, May 6, as a kick-off to our Big 5G Event. 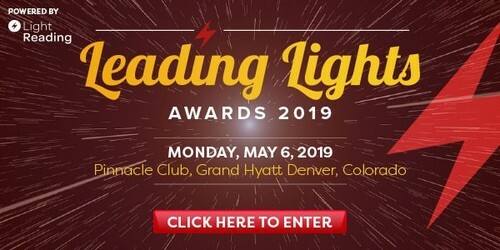 And as ever, as part of the Leading Lights process, we're seeking nominations for the Light Reading Hall of Fame, which recognizes those individuals, both the famous and the infamous, who have made a notable contribution to the global communications sector. Among those inducted in previous years are Steve Jobs, Bob Metcalfe, John Chambers, Brian Roberts, Kris Rinne, Martin Cooper, John Donovan, Mukesh Ambani, Irwin Jacobs, Larissa Herda, James Crowe, Niklas Zennström, Edward Snowden, Reed Hastings, Hedy Lamarr, Bernie Ebbers, Basil Alwan, Mark Zuckerberg and John Legere. So get cracking on those entries -- if you've had a great year, don't miss the chance to have it rewarded with the most prestigious award in the industry. And remember, the deadline for entries is the end of the day (PST) on Friday, March 29... but not a moment longer.